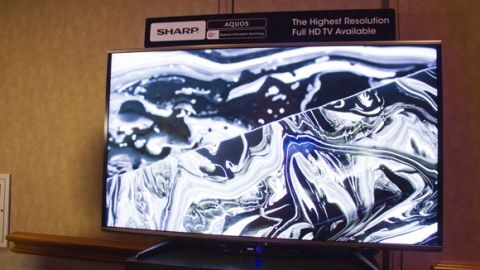 Sharp unveiled a slew of new TVs at a pre-CES press conference on January 6, and surprisingly the 4K sets were not the highlight. No, the Sharp Aquos Quattron Plus, a full HD 1080p display, stole the show, for one simple reason: it's a non-4K TV that is capable of playing Ultra HD 4K content. The Quattron Plus follows in the footsteps of the original Aquos Quattron line of TVs that Sharp launched in 2013, but where the original Quattrons (or "Q series") sets added 2 million subpixels, the Quattron Plus (Q+) adds 10 million. The Sharp Q+ downscales Ultra HD content and upscales standard full HD content, and it makes everything look better, Sharp Retail Execution Manager for New York and New Jersey Edward Hernandez told TechRadar after the press conference. A standard full HD 1080p TV has 6 million subpixels, while the Q+ has 16 million subpixels. That's more than halfway to a true 4K set's 24 million subpixels, Hernandez explained. The result is that almost all content that goes into the TV, whether DVD, Blu-rays or another format, reportedly looks better than on other 1080p sets. Everything is upscaled using Sharp's "Revelation" upscaling tech. Meanwhile the Q+ actually downscales Ultra HD content. It displays a maximum of 2,160 vertical and 3,840 horizontal lines, but can display less, depending on the format of the content being played. After the press conference TechRadar got the chance to watch some downscaled 4K footage on the Aquos Quattron Plus, and the truth is it really looks fantastic. UHD skeptics be damned, there is truly a noticeable difference between 1080p and 4K resolution content. And so too is there a discernible improvement from normal full HDTV to the Q+'s downscaled 4K. It doesn't downscale the Ultra HD content far enough to turn it into standard HD content, but instead appears to fall somewhere in the middle in terms of image quality. The result is content that to the naked eye looks a whole lot like 4K, but on a TV that Sharp says will cost "half as much." Sharp emphasized that the Aquos Q+ has the added benefit of being future-proof, since customers will be able to watch Ultra HD content on it as 4K video becomes more prolific. But in the TV world, the dividing line has already been drawn between HD and Ultra HD. How is Sharp going to market and sell a device that's somewhere in between? "That customer that's in-between, they like the 4K content but they're not sold ultimately on it, but they do want to future-proof themselves for later on, it'll be our Quattron Plus technology, or Q+," Hernandez explained. "From being in stores personally I think that a lot of customers are looking for something like that," he continued. "The day of the TV being that 5, 6, $7,000 TV has been gone for a while. A lot of customers are sold on the lower price point TVs. So we want to give a customer a great picture quality TV, but at the right price point for them ultimately, but also protect their future for their investment as well." He continued, "Ultimately we're trying to give the customer the best of both worlds." Sharp's 4K-downscaling tech is definitely impressive, and may even be a necessary middle step as consumers begin to seriously consider upgrading to a UHD set. The picture still looks great, even if it's not really 4K. But Sharp may have a tough time convincing users to compromise, especially if 4K takes off in 2014 the way TV makers at this year's CES are betting on. And we don't yet know exactly how much the Aquos Quattron Plus is going to cost.